Posted on November 26, 2018 by Eric Bonnici wrote in Entertainment News. It has 0 Comment. Apparently to no one in a packed Colosseum theatre, at Caesars Windsor Sunday night, did it seem out of place for a 76 year old grandfather to be singing, what Sir Paul McCartney once called, silly love songs. 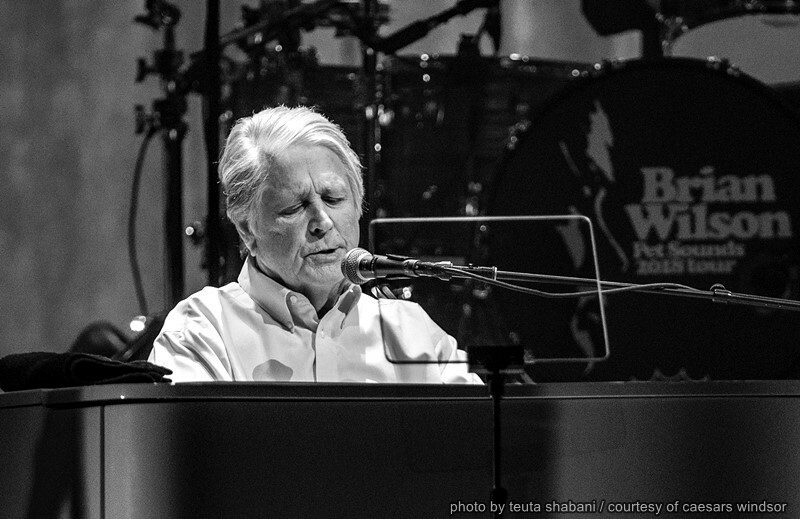 But that’s what brought 5,000 fans to Caesars Windsor to hear former Beach Boy Brian Wilson. While Wilson is no longer a member of the fabled surfer band, there is always something from the Beach Boys in every song he performs, be it the piano, the organ, the harmony or just the sound of his distinctive falsetto. He was, unquestionably the creative force behind the Boys and it is that creativity that allowed this grand all-American band to fight for music chart supremacy against McCartney and his Liverpool lads and the other so-called British Invasion groups who arrived, one after another, on America soil in February 1964. It was a revolution. California’s response started with unknown folk singers electrifying their guitars, growing their hair long and singing Biblical verses and writing songs about tambourines. Wilson, well ahead of the pack, fully cognizant of the dying market for ditties about hot rods and surfers started penning love songs, about girls like Barbara Ann, and proving that one US group could beat the Beatles at their new game – the concept album. 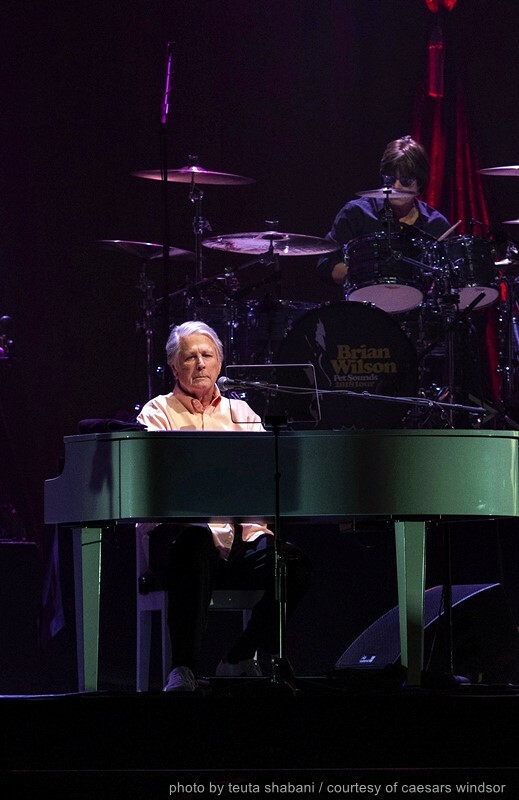 Brian Wilson performing on The Colosseum Stage at Caesars Windsor during his Pet Sounds tour on Sunday, Nov. 25, 2018. Photo by Teuta Shabani / Courtesy of Caesars Windsor. In 1966, a radically changed Beach Boys, now sporting long hair, released Pet Sounds. Fans loved the depth of the musical masterpiece and the critics labelled it one of the best albums of the 20th Century. 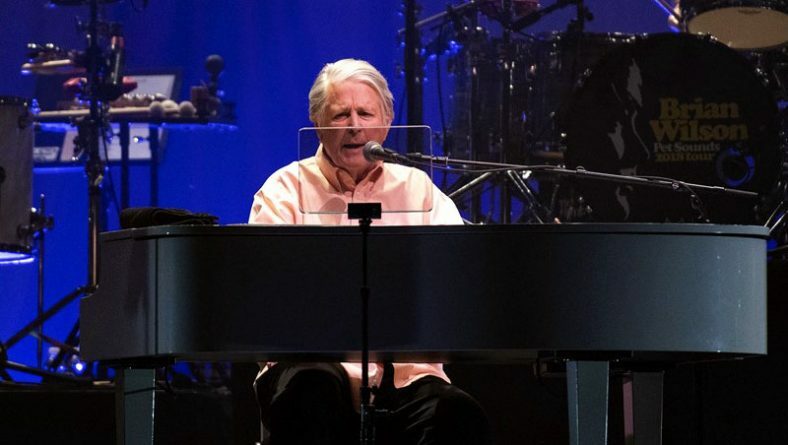 Brian Wilson uses its title for his current tour, one that has seen him and his entourage of ten ultra-talented musicians, playing everything from saxophones to harmonicas, perform at 200 concerts around the world in the last couple years. Wilson succeeded as few other bands of his early era did. He made the Beach Boys relevant with a certain American defiance in the face of competitive adversity. That defiance was most notable in Wilson’s fellow Beach Boy founder, Al Jardine, who stood by his side throughout the concert playing none other than an American Fender Stratocaster guitar plugged into a Fender amplifier tilted, just as the Fender engineers designed it with its side legs. This strategy to create a better sound is usually ignored by most musicians. They prefer the tower of power look. 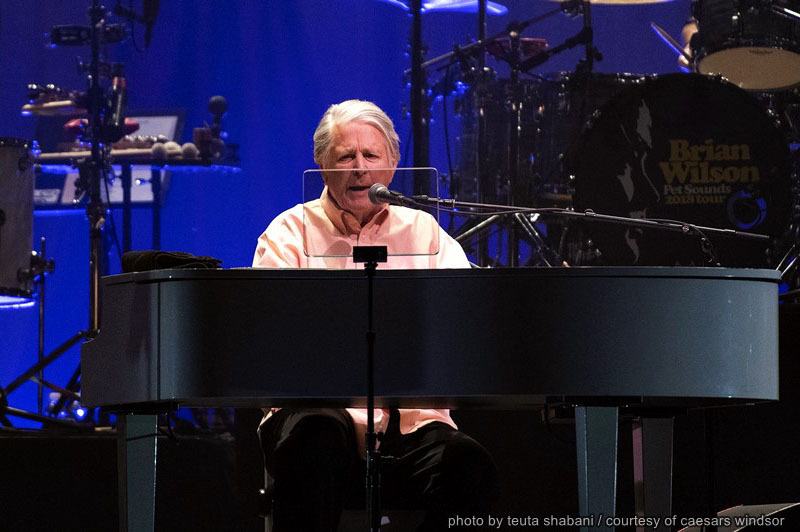 Brian Wilson singing and playing the piano at Caesars Windsor during his Pet Sounds tour on Sunday, Nov. 25, 2018. Photo by Teuta Shabani / Courtesy of Caesars Windsor. In those heady days of ’64, the interlopers came playing guitars like Rickenbacker, Hofner or Gretsch plugged into Vox amplifiers. But the Beach Boys held their ground, reclaiming at least some of the hit parade for America and its guitar companies. Their influence was not only on the charts. In its January 1969 famed roof top concert in London, Beatle George Harrison played a black Fender Telecaster which, like his mates on the roof, was plugged into a Fender amp. In some of Wilson’s work you can hear riffs that, for all practical but not legal purposes, mock those of the invaders while being some of the best rock and roll of all time. Jardine, when introducing Pet Sounds’ God Only Knows calls it the best song ever written by Wilson. No one challenges his assessment. If there is a takeaway from Sunday’s concert, it could well be the role Jardine himself played in the success of the Beach Boys. Sunday he sang most of their pre-invasion songs to complete audience delight. If nothing else he was somewhat the spark, encouraging Wilson in the band’s formative years which began in 1961. Ironically, he was a folk singer at heart and on Sunday wasn’t immune to bringing out his banjo. 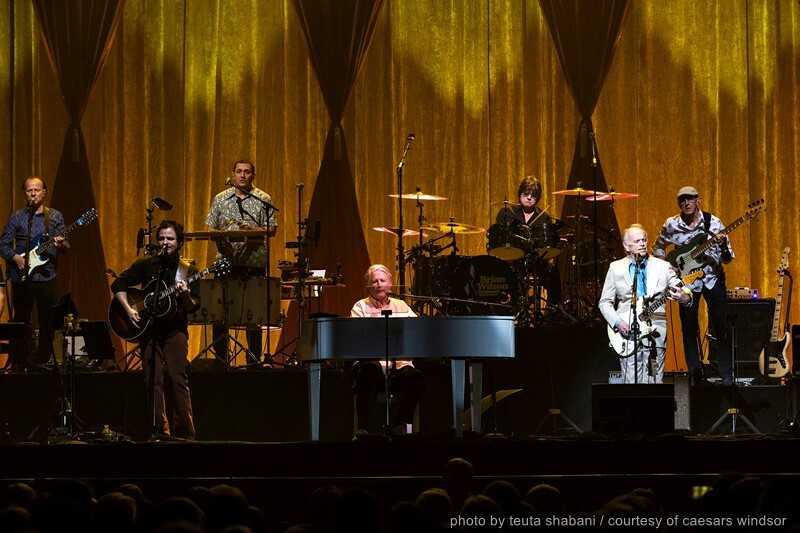 Brian Wilson and his band at Caesars Windsor on Sunday, Nov. 25, 2018. Photo by Teuta Shabani / Courtesy of Caesars Windsor. In two hours Wilson and Jardine with their new “boys” kept an almost never stopping pace – there was just so much music to re-live – so much musical history crafted by Wilson and sung by him, with the aid of a teleprompter, and Jardine and the high energy Blondie Chaplin. Chaplin, a bona fide Beach Boy, and the first South African in the group, joined in the early 70s and then became such a sought after musician that the Rolling Stones came calling. At 68, he demonstrated more than enough energy to execute moves like Jagger particularly while singing Sail Away from Wilson’s 2015 album No Pier Pressure and leading the orchestra on Wilson’s 1967 psychedelic Good Vibrations, to many the best rock and roll song of all time. As all good things do, the concert came to an end, but the music will never fade. Wilson proved that. Those there that night hold a least one Beach Boy song in their hearts, most likely a silly love song like Pet Sounds’ Wouldn’t It Be Nice. 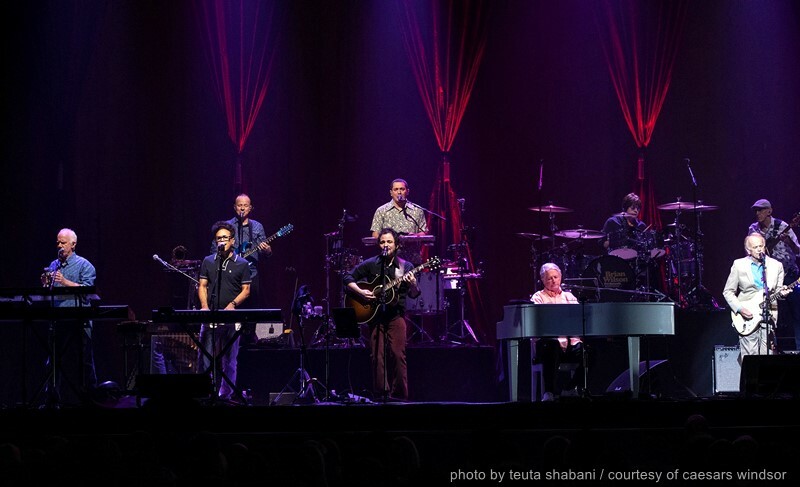 The Brian Wilson Pet Sounds Tour show was part of Caesars Windsor’s 6th annual Concerts for a Cure, an innovative social awareness campaign that is raising funds for five local cancer-related charities. Upcoming shows in The Concerts for a Cure campaign series include alternative rockers Three Days Grace (Nov. 29) and Country music star, Brett Eldredge’s Glow Live: A Night Of Holiday Hits (Nov. 30). In addition, Caesars Windsor will be holding several holiday shows including the annual local holiday tradition in the Sleighing Hunger Concert featuring The S’Aints (De. 21). Some of the latest exciting shows to be announced for 2019 include The Price is Right Live (Feb. 16 & 17) and Legendary Southern Rock icon Lynyrd Skynyrd (Mar 3).